From emojis to cookie cutters, the heart is emblematic of love and passion. The perception of the heart as the generator of emotions dates back millennia and is still heard today in the language we use to describe the heartbreak of unrequited love and the heartache of profound misery. Even memory is relegated to our blood-pumping organ, when we remember new information by heart. At some point, we learn that in fact it is the brain, not the heart, which generates and controls the polyphony of our emotions, the essence of our creativity, the outpouring of our wildest imaginings. Language, thought, movement, behavior and belief all originate in the brain. However for many of us, there is yet another leap of understanding to be made before we can begin to grasp the triumphs and aspirations of modern day neuroscience. Segev emphasizes the importance of constructing a mathematical model or a computer simulation of the brain. Based on experimental data, such a model will reveal not only how memories are formed and how emotions are conjured, but also the causes of brain diseases. His vision is to have “simulated-based medication,” or drugs that will be suggested by and tested on the computer model, before entering the pharmacopeia. It is Segev’s hope that a computational model of the brain, if accurate enough, will ultimately lead to an understanding of human emotions and, most importantly, human creativity. Then we will be able to find ways to release the rich creative potential that, he believes, is hidden within all of our brains. For the past 200,000 years, he explains, we have not undergone any significant genetic change. We have the same genome and therefore the same brain as our ancient homo sapiens ancestors. Throughout most of this period, we have focused on the challenges of survival, and it is our creativity (the good, the bad and the ugly) that has made us into the species that dominates the world today. For the earliest artistic examples of our creative genius, Segev points to the Le Chauvet cave paintings in France, and the Altamira cave paintings in Spain, both dated at around 30,000 to 35,000 years old. Even older is the Lion Man, an intricate 30-cm sculpture in mammoth bone, dated at around 35,000 to 40,000 years old, which was discovered in a German cave. Recent research has revealed that it would have taken 400 hours of skilled craftsmanship to produce it. And the recent identification of organic matter, perhaps blood, in its mouth hints at primeval religious belief. So, what is it that enables the human brain to reach such creative heights? And what is it that makes our brains so different from that of other animals? Segev suggests that it is neither size nor the number of brain cells – though the number of these neurons is important, and at 100 billion per human brain, that’s pretty impressive. Gorillas have about a third of this number and elephants have almost three times as many. But in terms of the ratio of brain size to body weight, we trump them all. What really matters, Segev believes, is the interconnections between all these cells. There are around 100 trillion synapses, or points of contact between neurons, in the human brain. However, not all of these synapses are always active – they change, both in the strength of existing connections as well as in the forming of new ones. Everything we do changes the pattern of connections and, consequently, the electrical activity in the brain that codes for new memories. Remember being told that you only use 10 percent of your brain? Segev was only seven when his teacher shared with him this supposed fact and he found it perplexing. In truth, we use all of our brain cells all of the time. Segev refers to this realization as one of two “light bulb moments” that set him on the road to becoming a neuroscientist. The second was at the age of 17, when he read about an experiment that demonstrated that a kitten only learns to see if it is able to move around, otherwise it will grow up blind! Sight and movement, it seems, are intimately connected in the brain; movement is essential for a correct interpretation of the visual signals we experience. In the human brain we have particularly intense long-range connections between different regions, and an extraordinary complexity of connections locally, with a single neuron in direct communication with about 30,000 other cells in its neighborhood or with cells projecting from further away. But even this is not enough to explain creativity. Segev suspects that the secret of creativity also has something to do with the fact that our nerve cells have a unique, “spontaneous” background electrical activity, an incessant electrical murmuring. This background electrical noise means that the brain responds in a slightly different way to identical inputs. Within this variability, Segev sees the possibility of a mechanism of creativity – in other words, you think differently although you receive a repeated input. Such randomized behavior of nerve cells will no doubt make constructing a computer model of the brain even more difficult. Undaunted, computational neurobiologists are already building a digital simulation of several cubic millimeters of rodent brain, something around the size of a pinhead. But even these humble beginnings are complex and expensive and require the cooperation of scientists from many fields. Segev is a member and founder of several interdisciplinary groups. 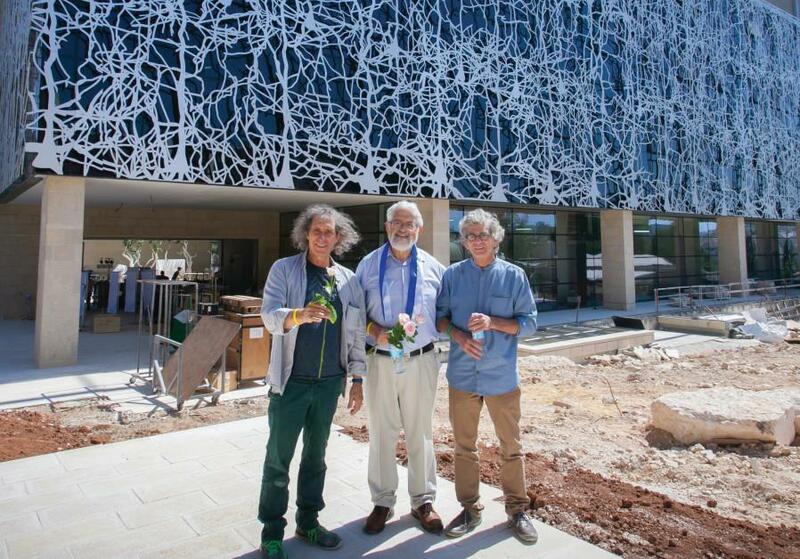 He was the director of the Interdisciplinary Center for Neural Computation at the Hebrew University, which blossomed into the Edmond and Lily Safra Center for Brain Sciences (ELSC). Segev is also part of the Human Brain Project, a 10-year initiative with a billion- euro budget and 100 laboratories, most of them in Europe, collaborating. The HBP affords him complete access to the IBM Blue Gene computer, which is capable of around six trillion operations a second. Although the computer actually sits in Lugano, Switzerland, Segev and his students can log on from their ELSC lab. On the day I meet Segev, he has just heard that a proposal to the US National Institutes for Health for a collaborative venture focused on human neurons had received a grant of $19.4 million for a five-year project. This project will bring together a group from the prestigious Allen Institute in Seattle, Washington, with four other groups – from Sweden, Hungary, Amsterdam and Segev’s, at the Hebrew University. “You have really come at a special time,” he says. The important thing now, he insists, is to shift from working with rodents to working with human cells and neuronal circuits. Using fresh, living human brain cells for research may sound like a good idea, but getting a hold of them is another story. Segev recently received a phone call from Prof. Natan Bornstein, an old army buddy of his. Bornstein, a neurologist, had moved from Tel Aviv to Jerusalem to become director and coordinator of the neurological- neurosurgical-neuroradiological service at the new neurology department at the Shaare Zedek Medical Center. Just a few minutes’ drive from the Edmond J. Safra campus on Givat Ram at the Hebrew University, this hospital is now a major center for brain surgery. It turns out that perfectly good, healthy brain cells are thrown away every day at the department. When deep brain tumors are removed, small pieces of normal tissue are cut out to provide access to the tumor, and the healthy cells are tossed. In October, Segev received ethical permission to use this healthy tissue in research at the Hebrew University. The first batch will soon arrive from Shaare Zedek and will be shared among the five groups at the Hebrew University. The prospect marks the beginning of a new era as research shifts from rodent brain cells to human ones. Segev’s enthusiasm for his research is palpable. Speaking to him, you feel as if every sinew of his lean frame is focused on furthering our understanding of ourselves. And then he says, “But there is something I am really, really interested in!” And the conversation turns in a completely different direction. He proceeds to tell me about a new online, open access, science magazine for kids, “Frontiers for Young Minds.” The magazine is actually an offshoot of another project that has essentially changed the culture of science. Currently, the process for getting a paper published in a scientific journal begins by it being sent to a publication’s editors, many of whom are not scientists, who reject 50-60 percent of submissions before sending them to a peer reviewer. The reviewers then reject a further 90 percent. The idea of changing this approach came to Segev about 10 years ago while at a conference in Brazil with fellow researcher Henry Markram. The two went on to set up “Frontiers,” an open access series of journals, where scientists post their papers online and reviewers, out of a pool of over 50,000 scientists, choose to review them. The reviewer then becomes a partner with the researchers and can suggest improvements and extensions to the research. When the paper is finally published online, the reviewers are named as part of the paper because they are seen as active participants in the research process. An outgrowth of this initiative was a science magazine for kids. Its format was inspired by Bob Knight, professor of neuroscience at the University of California, Berkeley. He insisted that, for a scientific journal for kids, the reviewers should be kids. The articles are written by leading scientists worldwide who are then grilled and challenged by kids, until the article is deemed to have sufficient clarity to be published online. Segev is currently setting it up in Hebrew for Israeli children. The hub of Segev’s multitude of projects is a modest office on the ground floor of the Alexander Silberman Institute of Life Sciences at Givat Ram. With no pretensions of architectural distinction, its long windowless corridors with exposed pipework recall a passageway to a ship’s boiler room. But take a deep breath before you open the door to Segev’s office and prepare for a visual experience that feels like stepping into a futuristic movie. It is neither the dusty shelves laden with books nor the mounds of papers that cover the desk that will claim your attention. Nor is it the bare walls apart from a small picture of a neural network or the whiteboard scrawled with snatches of things mathematical and neurological that will hold you in awe. On the far side of the room, wall-to-wall windows look out onto a rocky plateau below where the shimmering façade of the new Suzanne and Charles Goodman Brain Sciences Building stands. Designed by eminent British architect Lord Norman Foster, the four-story structure will soon become the new home of Segev’s lab and the pioneering, interdisciplinary ELSC. Looking at this innovative building, one can’t help but wonder about the potential output of the creative power of Segev and his team working within.